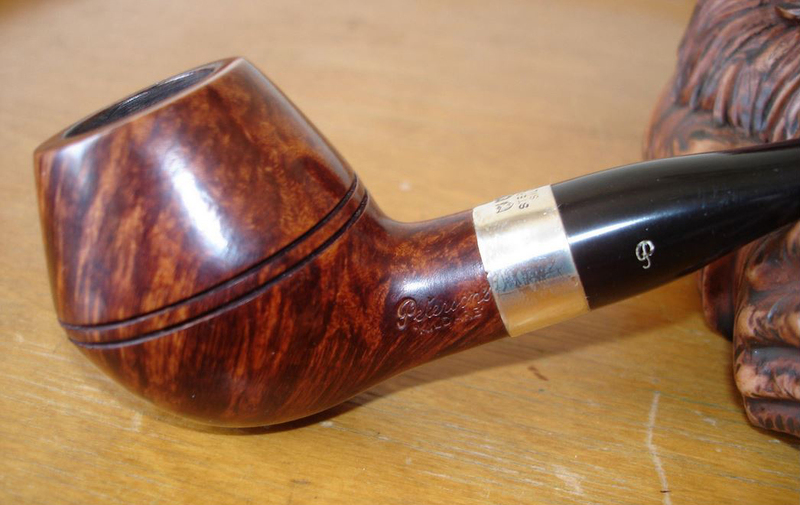 The B shapes, which first appeared around the turn of the present century, are among the most interesting designs you’ll find anywhere in the pipe world today. I had hoped to be able to present a complete catalog of every B shape that K&P has issued for our book, but even Peterson seems a little at a loss to know how many have been issued. I know the B61 number was given to the Limited Edition for 2012, but there have been a number of new shapes since then, so the Bs must be nearing the 70s by now. Going back nearly to the beginning of the B series, a second shape deleted in 2013 was the B2, which first saw service as the Y2002 Limited Edition, aka the POY for 2002. 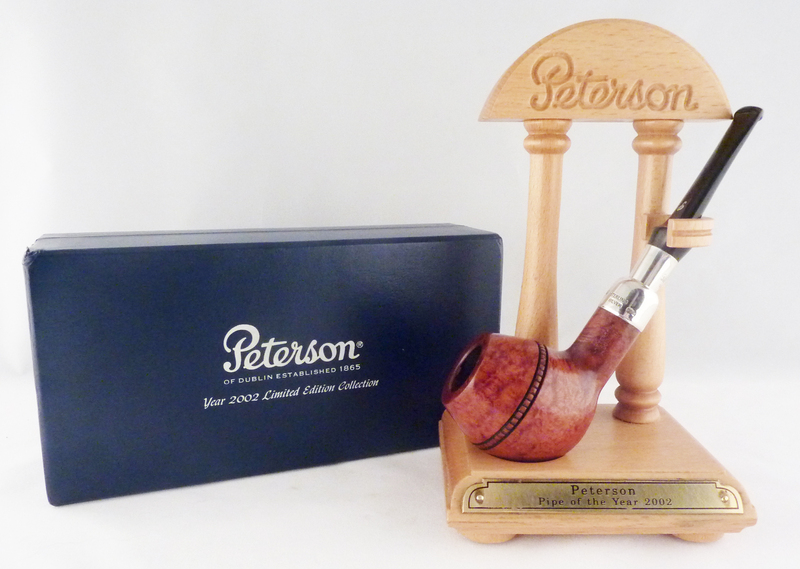 Like other early Limited Edition pipes, it was issued in a blue box with white lining, and like many of the Limited Editions, a special pipe rack was also made available. A straight rhodesian with a fancy double-bead (does anyone know the technical name for this type of beading? ), the Limited Edition 2002 features a plain sterling spigot mount with a sterling P inlaid on the vulcanite fishtail stem. Most distinctively, it is one of a handful of “setters” K&P has issued over the years (on which, more in later blogs). “Setter” is K&P’s original descriptive term, first applied in the 1905 catalog, designating any pipe with a flattened base. Paddy Larrigan, K&P’s master-artisan for the latter half of the twentieth-century, has a special fondness for setters, and designed a few himself, as readers of the forthcoming Peterson book will learn. He had entered semi-retirement by 2002, but it wouldn’t surprise me to find out he designed this pipe, or was an inspiration behind it. After its initial appearance as the Y2002, the B2 was released in a number of Classic Lines, including the Aran, Kildare (with sterling mount) Killarney (sometimes with no bead), Donegal Rocky, Rock of Cashel, Royal Irish Rosslare Sandblast, Dublin Castle, Red Spigot, and most prominently in the St. Patrick’s Day issues of 2007, 2009 and 2010. It probably appeared in other lines as well, but these are some of the more common. There are a few differences the Limited Edition and its Classic Lines brethren. Aside from the top-of-the-line briar and fancier beadwork, the Limited Edition is a larger bowled pipe, as the side-by-side average measurements below reveals. In its Aran incarnation I’ve found it to be a robust pipe with a wonderfully-engineered fishtail mouthpiece, comfortable for clinching and very open and deep, with a free draw. I smoked it continuously in Ireland in the summer of 2013, mostly outdoors, and never failed to get complete satisfaction. Highly recommended. Although they’ve mostly disappeared from the retail market, there are still a few lurking about on the internet—I believe Smokingpipes.com may still have some.